It’s finally here… The first day of Spring!!! Time to dust off the crop tops and open toe shoes… and time for us to dust of our clipboards as we enter into another amazing wedding season! Spring is my favorite season. Aside from the fact that we get to look forward to so many long and beautiful days, we also get to see all of the work that we’ve done for each of our couples come to life as we celebrate their special days with them. But with the beginning of Spring also comes the age old saying “April Showers Bring May Flowers”. Yay for flowers, boo for rain! But no need to fret if Mother Nature decides to throw a rain shower your way on the big day. We’ve got some advice on wedding rain plans to make sure that you are covered, rain or shine. In a perfect situation, you get married outside, on a mild 75 degree day, under a beautiful sunset. As a Planner it is my job to hope for the best case scenario, but plan for the worst. Because of this, I always tell my couples to be very mindful of the wedding rain plan options that your potential venues offer during their initial tours. Keep the logistic of these options in mind and what that means for an easy flow or transition into spaces for your guests during your event if the plan must be executed. Be aware of any terrain that may become muddy or slippery if the plan includes covered outdoor spaces. This may take away from the overall guest experience if they fear getting drenched every time they have to leave the area go to the restroom! You may not mind braving the storm for your picturesque wedding photos, but not all of your guests may be on board. They have more than likely come to your wedding dressed to the nines and have spent a significant amount of time on hair and/or makeup to look great during all of those wedding selfies. 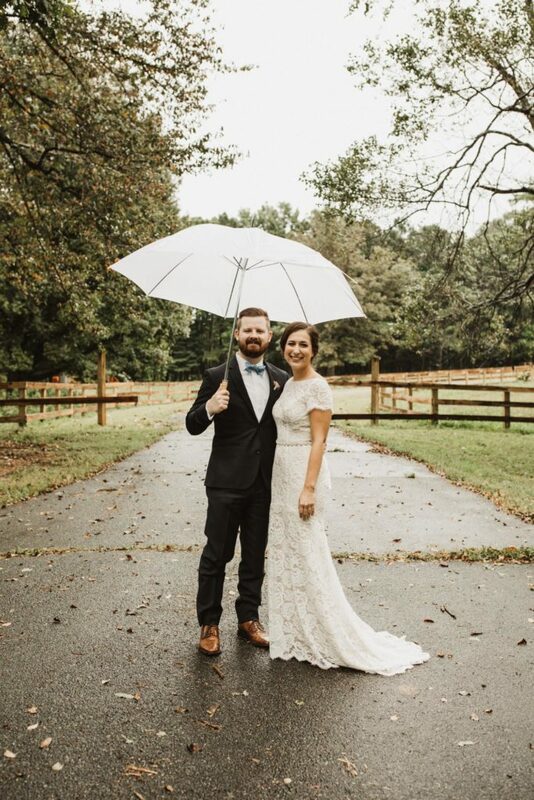 In addition, if a lot your wedding guests are from out of town, they may not have prepared for inclement weather by bringing an umbrella and assume that they will be indoors if it rains. Layered material and dropping temperatures make for chilly guests as the night goes on and doesn’t tend to bring the party animal out of anyone! If you absolutely must have your wedding outdoors, rain or shine, then I would recommend ordering umbrellas in bulk to provide for your guests. Amazon to the rescue! Although I have never talked to a couple who said they would prefer getting married on a rain or overcast day, there are indeed many benefits. Photographers absolutely love the lighting on overcast days and there are definitely some magical moments to be captured. Depending on your wedding venue, there are also so many indoor opportunities to make your wedding day as cozy as can be. Lastly, rain on your wedding day is said to be a sign of good luck in many cultures. Hey! We’ll take all of the luck and fortune for our couples as we can get!